In this very touching film featuring one of the all-time greatest actors, James Stewart, is a tale of friendship, care and tolerance. 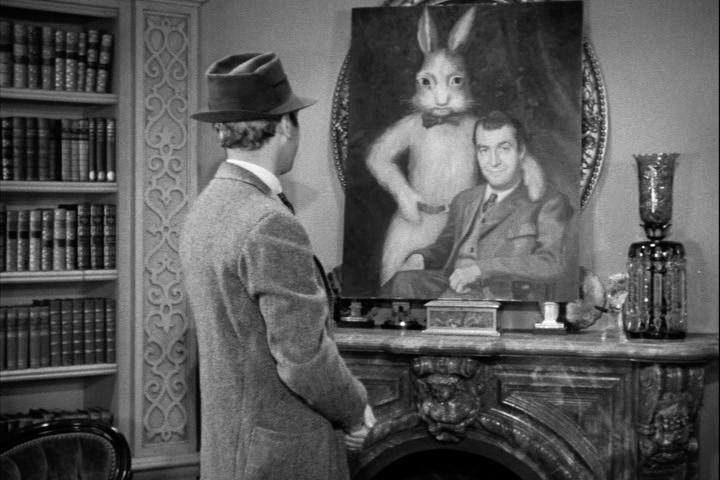 In Harvey, Stewart portrays the eccentric Elwood P. Dowd whose best friend is an invisible six foot tall white rabbit named Harvey. His sister Mae (Josephine Hull) has clearly had enough and decides to commit him to an institute. However, a comedy of errors begins to insure because of Elwood’s charming personality! James Stewart without a doubt offers a superb performance as a very unusual yet extremely loveable gent. This gent is of course very different from most average American men as said before but is always capable of providing a warm face round town who always insists on new faces to come round his for a meal or a drink and constantly offers them his card and so on. Elwood’s mannerisms around Harvey such as his arm out in front out the public and the chatter in the tavern are beyond brilliant that it felt like I could see Harvey sharing a smooth glass of Martini with his fond drinking pal. Josephine Hull in turn creates a highly beautiful performance as Mae, implying obvious desperation for pride and superiority. Having been in the original Broadway production of Harvey, Hull shows strong determination in her role as an embarrassed yet concerned and loving sibling who really just wants Elwood to move on from his quirky lifestyle of drinking and constant chatter with an invisible rabbit. The script written by Mary Chase, who based the film on her Pulitzer Prize winning play of the same name offers a hilarious satire of keeping up appearances along with the notion of respect towards others which I found to be intriguing. The most important thing I could say about the film is that its very straightforward. It isn’t at all complicated, jumbled or something to really focus on for deeper meaning. It’s quite a simple film which was made to be enjoyed by all, the humour throughout really worked for me and personally found it touching and all the more enjoyable for its message. Although some can be put off by the idea of watching a film in black and white due to it being made generations ago; to them I’d say “Watch Harvey, you won’t regret it!”. All together, Henry Koster as director of Harvey provided me with a lovely film on the importance of imagination and love, being good towards all and acceptance! A heart-warming film with real character and very pleasing performances.